Net Entertainment Gaming Software brings you a fun mariachi theme in the form of a video slot with 5 reels and 40 pay lines, Spinata Grande. 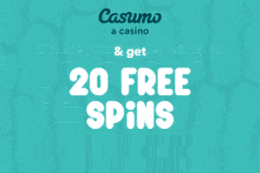 Starting from just 20p a spin, it features a mini slot feature which guarantees you wins and triggers a free spins feature and colossal symbols. Why Spiñata Grande? It's a celebration. Find out what's inside the Piñata and join the party with these wild features and crazy animations. Where to play Spiñata Grande? Filled to the brim with confetti, candy, spinning piñatas, and just overall fun wrapped in a mariachi theme is Spinata Grande slots powered by Net Entertainment (NetEnt). This epic slot game consists of 40 pay line and 5 reels with a lively soundtrack in the background to get you in the mood. You can play Spinata Grande slot in any casino that features Net Entertainment games. 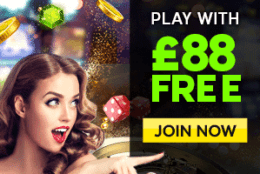 But we would like to recommend you three casinos which we think are the best to start off with as they are trusted and have great bonuses on offer upon signing up. Bet Victor Casino is known to be one of the top online casinos out there and has a wide range of games to offer to their players. After you sign up, your first deposit worth of £10 will earn you bonuses worth £50. 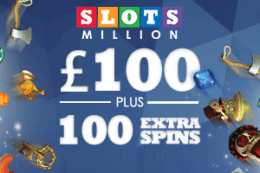 On a similar note, Video Slots Casino will reward you with 11 welcome spins along with a 100% match bonus up to £200. With Leo Vegas Casino, you will receive 20 free spins which require no deposits to retrieve. 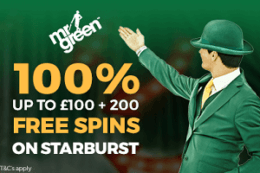 A new player will receive a 100% bonus up to £300 along with 30 extra free spins on a minimum deposit of £10. A joyous, colorful theme centered on mariachi, Spinata Grande is full of smashing piñatas and candy amidst a Mexican village as the backdrop. There are 70 ways to smash all these spinatas, and players of all different types will be able to join in the fun. Net Entertainment has really thought this through and tried to freshen things up. The involvement of the colossal reels was a nice touch, which are symbol blocks that come in either a 2 by 2 or 3 by 3 form. This, coupled with the various features really do spice things up and makes this an interesting gameplay. Before you get all excited and start smashing all those spinning piñatas, set your wager amount by clicking on the “Coin Value” and “level” buttons. This way, you can determine your coin denomination and set the number of coins per line. You can also choose to go forward with the maximum bet that is playable through the “Max Bet” button before you hit the Spin button to start off with your game. In addition to that, you will also find an “Autoplay” option. It’s a very handy feature that allows you to set the game in motion and will keep playing for a significant amount of times chosen without any interruption. The game can be viewed and played on any device – desktop or laptop, tablet, or mobile phone. Is compatible with iPad or iPhone. A fish, a tropical bird, a donkey and a bull are shaped into a piñata which is considered as the 4 symbols with higher values, otherwise known as Spinatas. The other lower symbols are made up of the typical letters J, Q, K, and A. During the bonus feature, you will see the wild symbol and the wild in the form of a star piñata and a skull respectively. Always colossal, the bonus symbols features a slot machine in a sombrero. 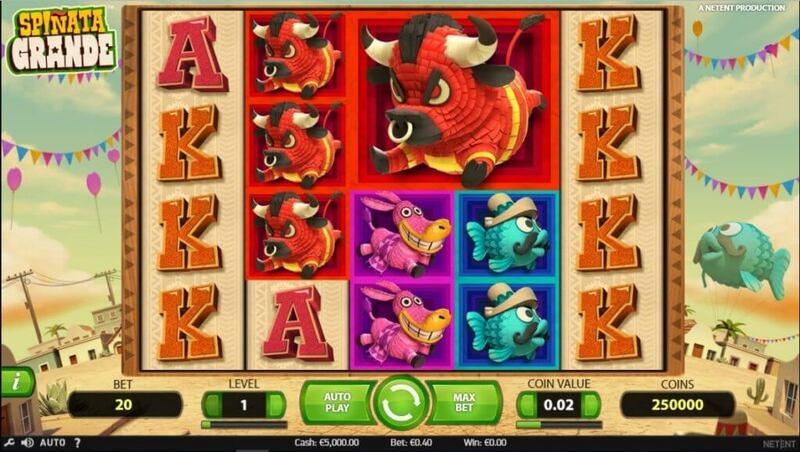 The mini slot is activated when you land a few, or better yet all, colossal bonus symbols on the reels displayed on your screen. The bonus symbols will spin in place and will cause either a coin, free spin, or an extra feature. 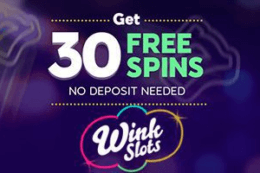 During the mini slot, if you manage 3 free spins symbol then you start the free spins feature, and you will be awarded 5 more spins with each spin making another addition. This will continue on until there are no free spins left and all your rewarded coins will be converted into a cash prize. The colossal wild is a 3 by 3 wild symbol, and triggering the Colossal Wild 3 times has the potential of warning you 8 extra free spins which can lead up to almost 300 times your overall stake. The letter symbols carry a multiplier from 2 to 40 times your bet, and finding the piñatas will give you some of the biggest payouts. Here is a breakdown of the winning distribution between the spinning piñatas and the stakes. 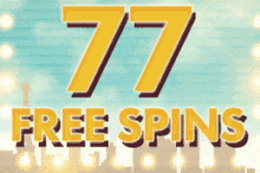 Spinata Grande can be deemed as a medium variance slot as it has the potential to win the most during the free spins feature. 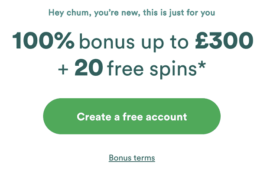 Unfortunately, playing in the base game does not prove to be quite as lucrative as it is in the free spins feature or during the colossal wilds. Do keep in mind that it is very rare that the colossal wilds will show up much, hence do keep your patience. Having said that, you cannot expect much from the wilds either as you can earn up to 60 times your initial bet on one spin only. 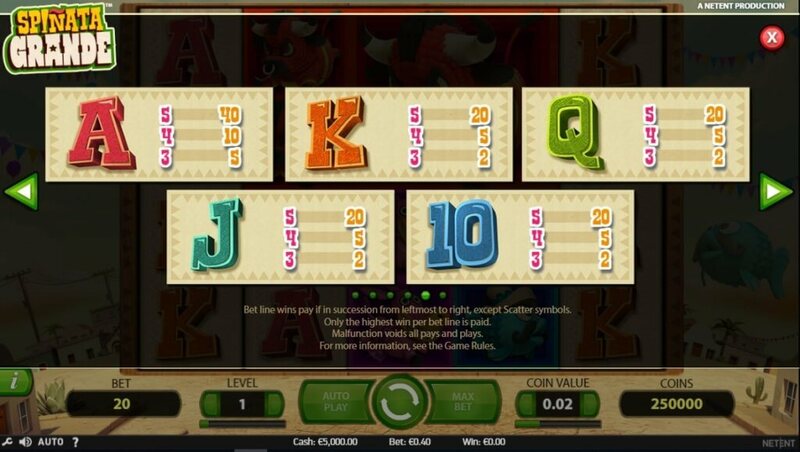 The Mini slot feature, on the other hand, is a whole different story as it is proved to be the most profitable out of all. Hoping that review was informative and helped you garner some knowledge regarding Spinata Grande. If it has intrigued you then you can play it for free in the three casinos we have recommended above. 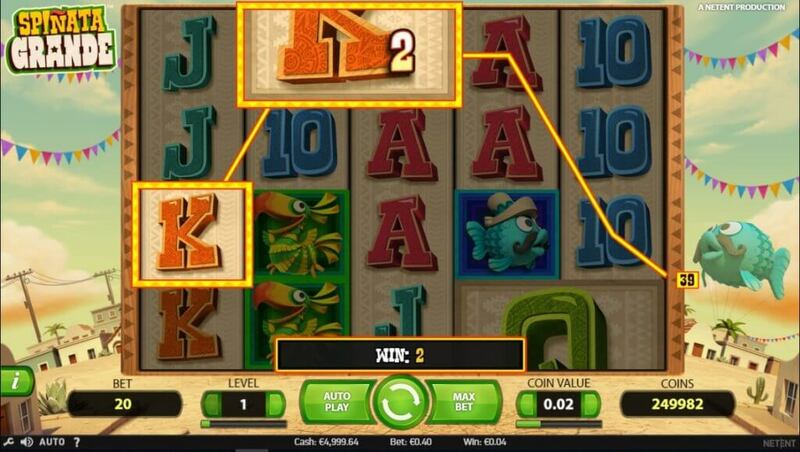 They are trusted and have tons more slots to offer in their extensive library of casino games. Moreover, they have tons of welcome bonus offers that you do not want to miss out on. After that, if you feel like you want to play with real money, you can visit Net Entertainment’s official web page to play for real. Net Entertainment has been in the industry since almost the beginning of the gambling industry itself and has rightfully earned their reputation as one of the best ever software providers there is to exist today. Just like all the other games hosted by this game developer, Spinata Grande is no different as it is everything players expect and more. From the high-end graphics quality to the endless bonuses and free spins that help fill up the pockets of their players, not to mention the smooth and seamless operation. If you are already a Net Entertainment fan, you will undoubtedly love this one too.